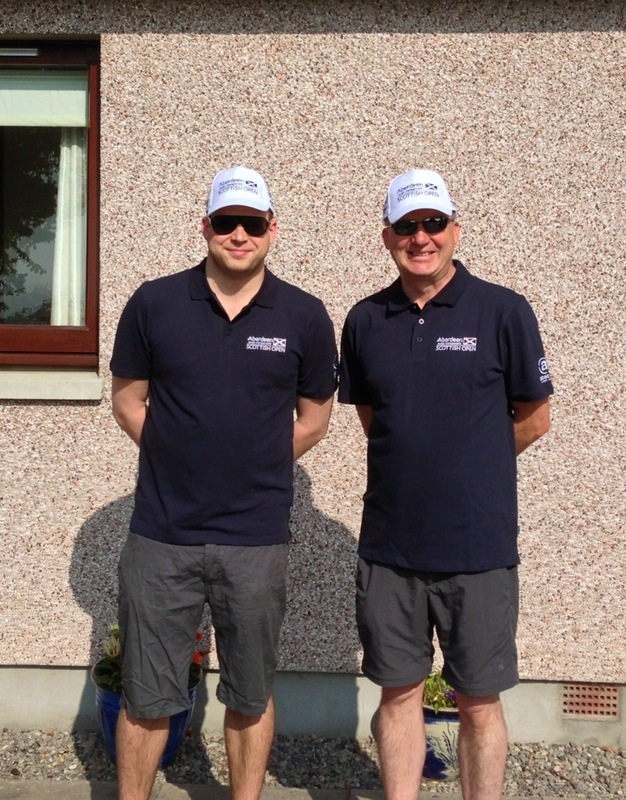 My dad and me in full Scottish Open regalia. In the last year or so, I’ve tried my best to experience sport in as many different ways as possible. Having done the Olympics (admittedly just the football), gymnastics and been to see a football match in Spain, it was time for some golf. And this time, on the inside of things. This year’s Scottish Open, as with the last two, was held at Castle Stuart on the outskirts of the capital of the Highlands, Inverness. As part of this, my father (let’s call him John, because that’s his name) was in charge of co-ordinating the various scoring volunteers. Therefore I was given the opportunity to spend four days walking around a lovely golf course with some of the best golfers in Europe while carrying a scoreboard, with three of those four days involving fantastic sunshine into the bargain. The tournament itself had started with serious questions about the course and the tournament’s reputation. Graeme McDowell questioned the legitimacy and difficulty of the course, before very quickly climbing down after the European Tour (rightly) expressed their dismay with his view. As I heard a number of people say, McDowell not only appeared to be after a reaction and self-publicising, he also seemed to be doing down the ability of his fellow professionals. That became particularly apparent on the second day when the cut was made. Having wandered round with Martin Wiegele, Ricardo Gonzalez and Steve Webster on the first day (receiving a ball from Mr Wiegele – he’s now my favourite Austrian golfer), I spent day two wandering around keeping track of the scores of Paul Casey, Branden Grace and Martin Laird. All three played excellently, and it was an absolute privilege to witness some top-notch golf from close up. In the group in front of me, Ernie Els was struggling and could only finish on -2, two shots shy of the cut mark of -4. The reigning Open champion was out of the warm-up for this year’s British major, and McDowell was therefore left to look rather silly. In my view the tournament really came to life on the final day. Having had three days of light wind and bright sunshine and thus being able to get a relatively easy ride out of the Invernesian course, the players had a rather different time of it on Sunday. With only 5 players breaking 70, the wind and the cloud clearly played a part, with Castle Stuart demonstrating its potency as a tricky traditional links course. I went round with Nicolas Colsaerts and Hennie Otto (a South African) and again thoroughly enjoyed myself, Colsaerts playing an absolute beauty on the 18th from next to the hospitality tent (!) to within three or four feet, sinking the birdie putt for a 69. Big Phil Mickelson won in the end, beating Branden Grace (a thoroughly nice chap) in a play-off. The weekend and the weather provided a wonderful advert for Inverness and the Highlands, with the competition being broadcast live on the States on NBC. The tournament organisers could also happily lay to rest the ghosts of the catastrophic weather in 2011, when the four rounds were cut to three due to the record rainfall and subsequent landslides. As for me, I greatly enjoyed wandering round for 4 days carrying a scoreboard and watching the golf. The Open at Muirfield gets underway tomorrow (Thursday) at 6:32 and should provide quite a weekend’s play.